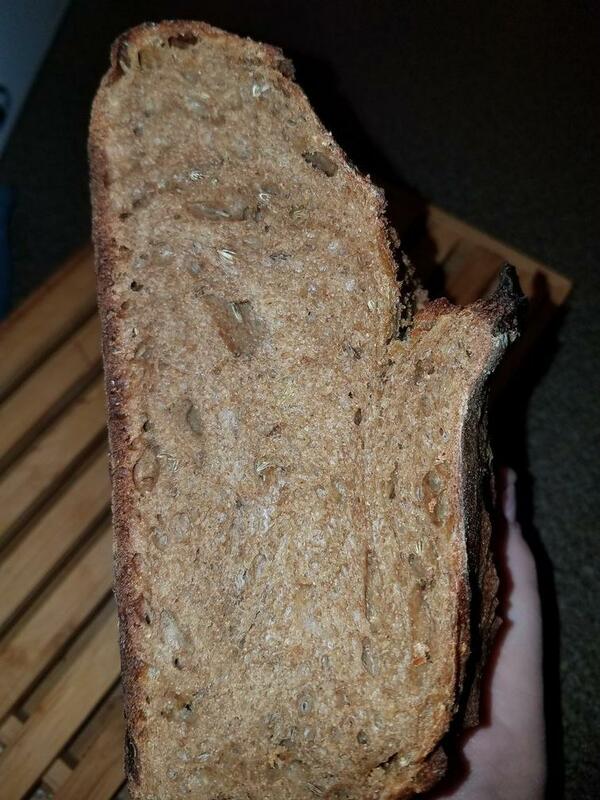 First time making rye bread and was really happy with the outcome. Wow! and well you should be! That's impressive! Is that all rye? it is 50/50 bread and dark rye with molasses in. have you made rye bread? No, not yet, still working my way up to it! My starter is, however fed only rye; I've had my eye on a couple of loaves, mostly of the Danish/German types but am having trouble sourcing whole-grain rye flour (T170 here in France); I can get something called whole rye flour (T150) which they call "dark rye", and something that I use for my starter which I can only guess would be called medium rye (T130). 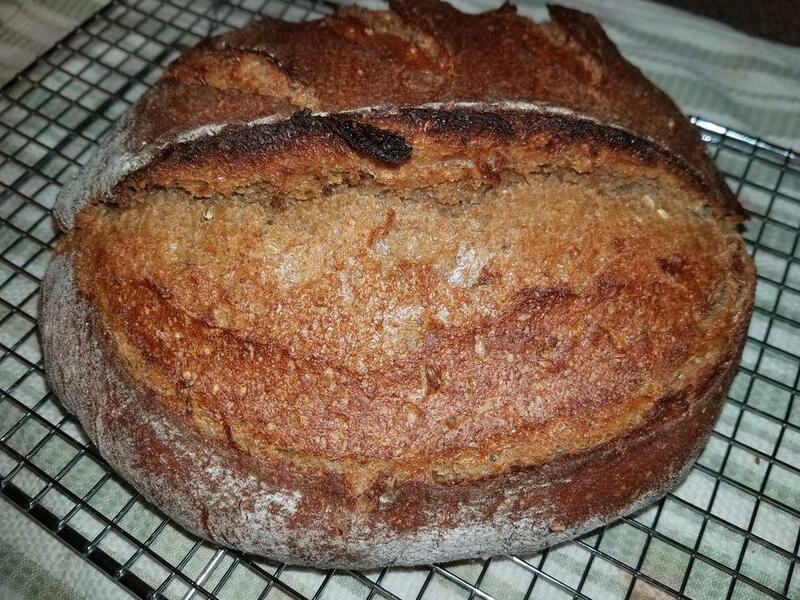 So if you used dark rye, I might attempt something like that. Got a recipe/formula? Molasses: 44 grams, 2 Tbs. Fennel Seed: 8 grams, 1 Tbs. Anise Seed: 2 grams, 1 tsp. Caraway Seed: 3 grams, 1 tsp. Salt: 12 grams, 1 3/4 tsp.  In a mixing bowl, mix the starter into the water. Add the molasses, all the seeds and orange zest.  In a separate bowl, combine the flours and salt.  Gradually stir the dry ingredients into the wet using a dough whisk or spoon until the flour is well incorporated. Cover with plastic and let rest for 15 minutes. After about 15 minutes, mix again for a minute or two. Again let rest for 15 minutes and mix one more time as before. Now cover the bowl with plastic and let sit at room temperature for roughly 12-14 hours.  The only difference is don’t use sourdough starter and instead mix the instant yeast into the dry ingredients before combining with the wet ingredients.  After the long 12-14 hour proof, stretch and fold the dough and shape into boule or batard (round or oblong) shape for baking. (If you didn’t follow that, I’m afraid you’re doomed to watch the video.) Cover again with plastic and let rest 15 minutes before putting in a proofing basket for the final rise. If you don’t have a proofing basket, line a bowl with a well floured kitchen towel and put the dough in there for the final rise. The final rise should last somewhere between 1 to 1 1/2 hours. Keep the dough covered with plastic to prevent it from drying out.  Preheat your oven to 475 F a half hour before baking.  Score the dough with a razor or sharp serrated knife and bake until the internal temp is about 200 F.
 Let cool completely before eating. On 12-14 hour proofing period: I typically prepare everything in the evening for baking the next morning. You can also mix everything up in the morning and refrigerate until evening then remove before bed to resume the proofing at room temperature. Alternatively, if you get started with mixing everything up early enough in the morning, the bread can also be ready to bake in the evening. This is a nice option when you want fresh bread ready to eat for breakfast. That's great, thanks so much. and my head is hurting lol, I guess my bread baking is not that intense to see the issue. I am smiling if that helps you are all?